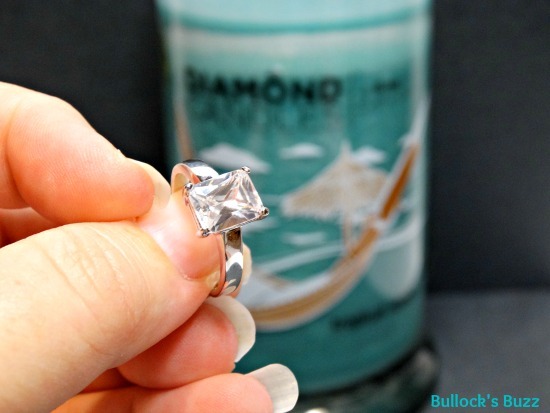 Diamond Candles – Scented Soy Candles with a Ring Inside! If you or someone you know loves candles and jewelry then I have got a great gift idea for you! Diamond Candles! Diamond Candles are 100% soy wax candles that come in a rainbow of colors and scents, and inside every candle is guaranteed to be a ring worth $10, $100, $1,000 or even $5,000! I especially like the fact that they candles are soy wax simply because soy wax burns a lot cleaner and longer than paraffin. Paraffin is actually made of petroleum, whereas soy comes from soy beans, so when you burn a soy wax candle you are not getting the toxins and pollutants you can get from paraffin. Each candle comes in a heavy glass jar with an airtight lid, so once the candle is used up you still have a nice jar that can be re-used for all sorts of things. Choosing a scent was the hardest part as there are so many different options. I finally decided to pick the Tropical Retreat. This scent is colored a pretty aqua blue that reminds me of the Caribbean sea, and according to the site its scent is a blend of green bananas, coconuts, oranges & grapefruits. . When you first remove the lid the scent is quite strong, but it tends to be a bit less potent once it is burning. While I couldn’t pick out the individual scents, together the do make a very fresh and pleasant tropical scent. You can also see where the ring is through the glass. If the ring has ’14k’ or similar information imprinted on the inside of the band than you have a ring that is worth $100+. We advise that you take it to a jeweler to get a verbal estimate to see if it is worth $100’s or $1,000’s. If the ring has ‘Thailand’ or something similar imprinted on the inside of the band it is most likely worth $100 or less. Unmarked rings are likely to be toward the $10 range but could be valued up to $100. I could tell almost immediately that my ring was not worth $100, let alone $5000. Although it does have a marking inside, it is obviously a piece of costume jewelry, albeit a nice piece! Weight-wise it is fairly heavy, and the stone itself is clear and free of bubbles. Size wise it is a bit big, I would guess around a size 8 or 9. Although it is not my personal style, my niece fell in love with it, and I am happy to still have plenty of candle left to enjoy! 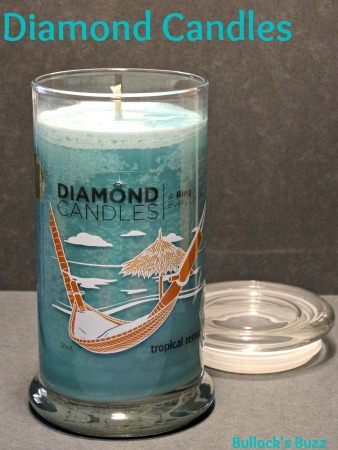 Diamond Candles is changing the way the candles work! As of October 8th, each Diamond Candle will come with a ring valued at $10, as well as a RINGREVEAL™ code. Enter the code on the RINGREVEAL™ page of the website (making sure to log in with a Facebook account or to create an account). They will then reveal if the code is worth $100, $1000 or $5000! If you’re a lucky winner, you’ll get to choose the ring of your style and size in their exclusive ring boutique. And if you don’t win, you will always have the ring you found in your candle! Is Diamond Candles Worth It? Each candle sells for $25 before shipping. While I believe that a large part of the experience is the excitement of waiting to find out if you got one of the $5000 rings, you still get a pretty candle that smells good and burns for a long time regardless of the ring you find. 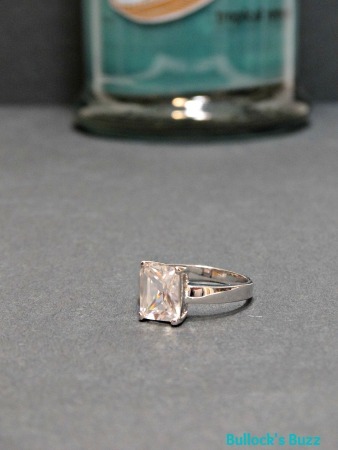 If you really want to break it down, since the ring is worth at least $10, then you are only spending $15 on the candle, and that is not a bad price for a scented soy candle of that size. 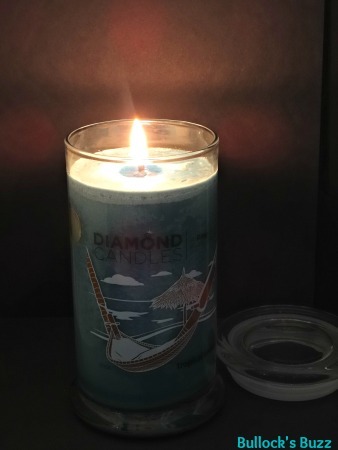 With the Holidays right around the corner, Diamond Candles would make an excellent gift idea. After all, it’s hard to go wrong with a scented candle, and the fact that there is a piece of jewelry inside is an added bonus! They even have candles for other special occasions such as birthdays, anniversaries and even the birth of a new baby! Select your favorite scent and order your candles directly through the Diamond Candles website.